Super busy this hexie weekend with a yard sale and a booksale, so Billie at Billiebee's is handling the linky. Thank you, Billie for agreeing to gather eye candy for us. We love eye candy of any kind. I did finish a quilt this week. Go here to see it. Also I was sorting and found this flimsie again. I've finally decided to deconstruct these hexie blocks and machine applique them onto a new background. The muslin is the weakest part of this top and hope to salvage the top that way. I may put the little green diamonds also. What would you do? First I trace the pattern onto a piece of freezer paper. I then cut between the feathers of the circle almost to the center circle. 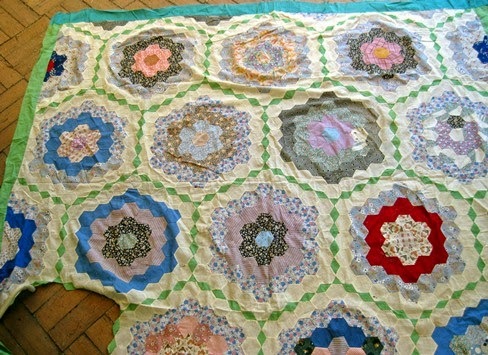 Once I have cut it all out, I iron the shiny side to the top of my quilt where I am going to place that element. Then I machine quilt the motif by starting at the circle, traveling up a feather and then down the spine of the next feather to the circle again. Repeat all the way around. Since I have already cut the paper for the feathers, it's easy peasy removing the paper. And here's what it looks like once it's done. Go on over to Billie's and share a link. 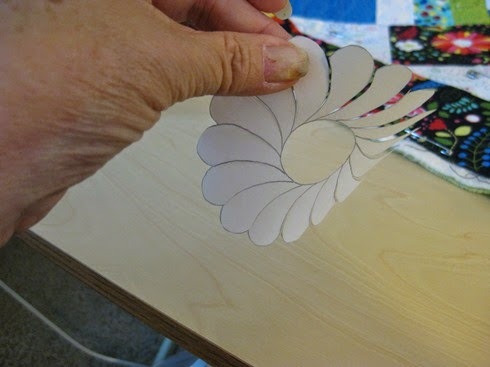 I'll pick one of those who link to get 100 one inch hexagon templates to try your hand at hexies. Wish me luck in the next two days. I'm linking to Amanda Jean's Finish it Friday and Sarah's Can I have a Whoop, Whoop? 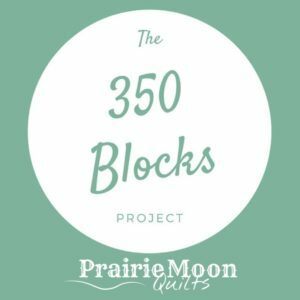 Do stop by. 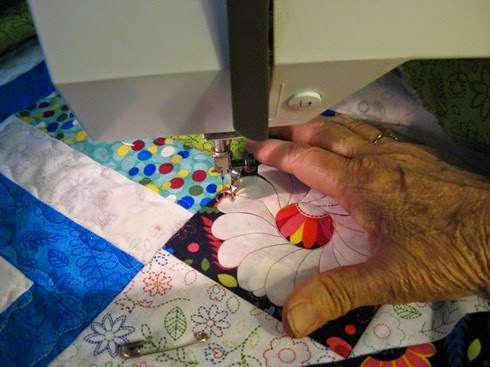 Thank you for the tip on quilting motifs. 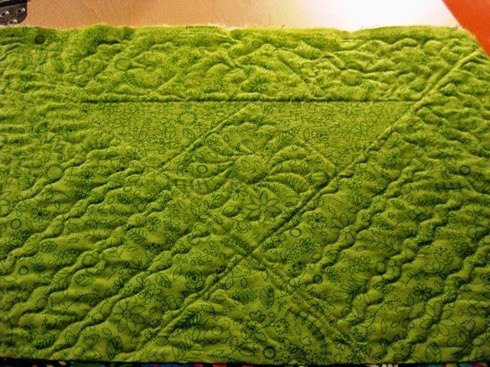 I have shared it on FB with my quilting group. Have a great weekend and I hope the yard sale goes well. Good luck with the applique, love to ome back to see it finished. Thanks for the tutorial. I never thought to use freezer paper in this way. I sometimes use tracing paper. I just trace the design on the paper, pin it to my quilt and quilt on the lines. 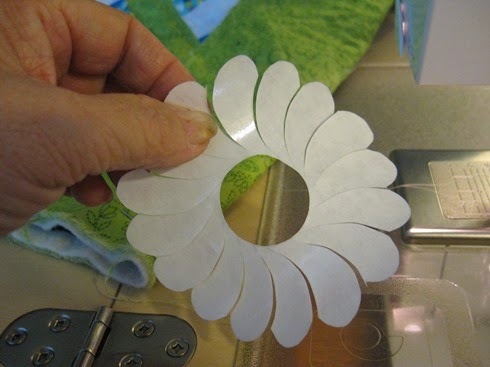 The quilting perforates the paper and it removes very easily. If there are little bits of paper left I gently rub them with a clean pot scrubber and they are removed. Your freezer paper method would eliminate that problem! Thanks for the freezer paper template trick! 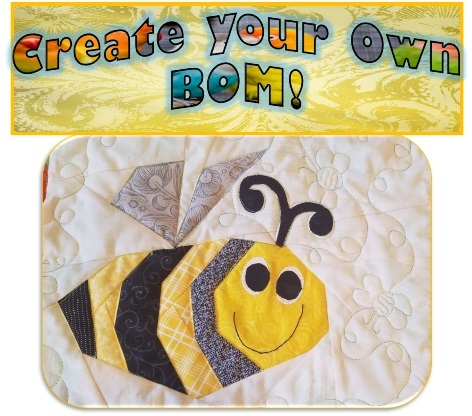 I'm new to FMQ and need all the help I can get. I'm having a ball practicing on my new Janome. thanks for sharing that technique. pretty neat.